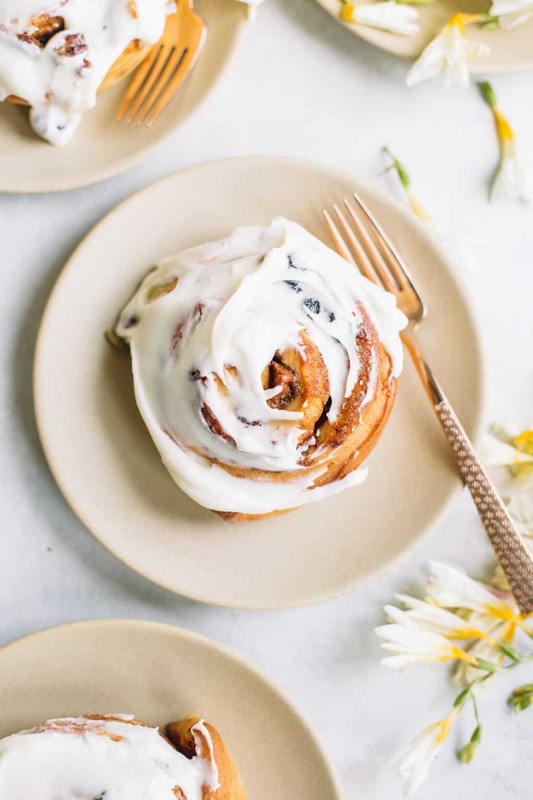 Celebrate spring with homemade carrot cake cinnamon rolls! 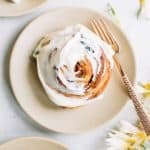 These unique cinnamon rolls are a spring take on the classic recipe that we all know and love. Still just as fluffy, gooey and mouthwatering! Save this dessert or brunch recipe for Easter, Mother’s Day or any spring gathering this season. I promise you’ll be a legend. Make it, save it, print it, do whatever you want with it but I really hope you get to eat them above everything else. 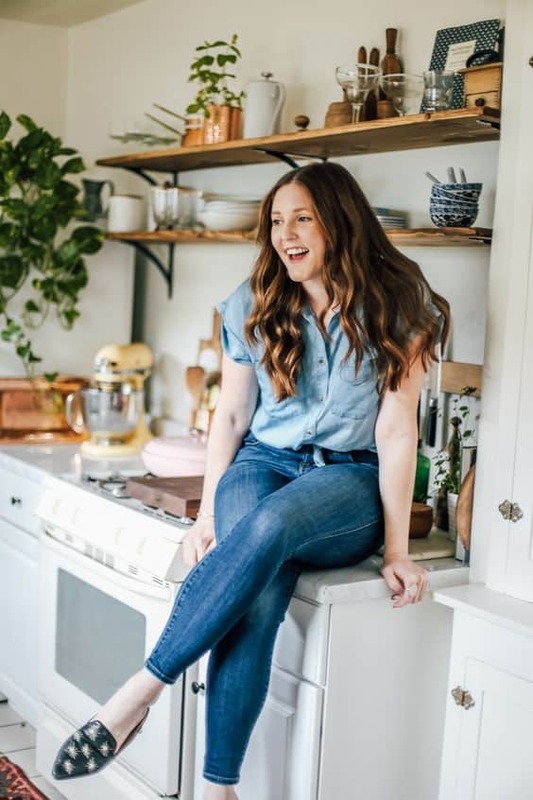 It seems like Abbie and I have a weekly discussion about trying out new and playful recipes for the blog (hello, funfetti white chocolate blondies) but sometimes we feel a little remorse because we both LOVE a seasonal classic and don’t want to miss out. I mean who doesn’t love classic carrot cake?! 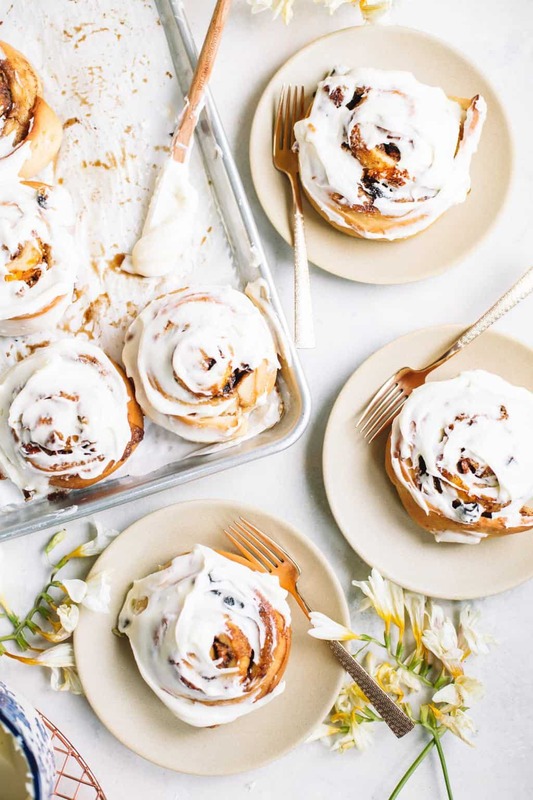 So, I promise you that these carrot cake cinnamon rolls actually are the best of both worlds (yes, just quoted my girl Hannah lol). 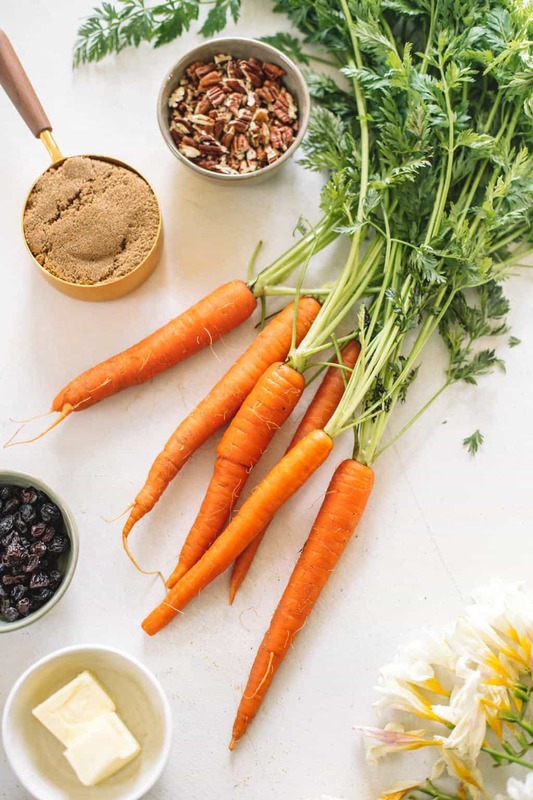 They will fulfill your carrot cake cravings in a new and fun way! I love walking into a party with a dessert that’s a little bit different but still makes people want to dive in with both hands. So are they really just cinnamon rolls?! Well, yes sort of! 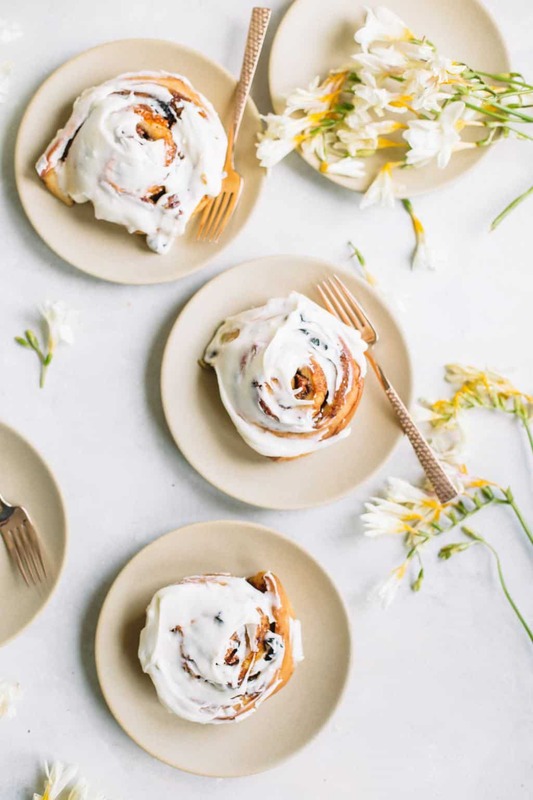 The actual dough part of these carrot cake cinnamon rolls are pretty much your basic cinnamon roll dough. The inside filling is where things get fun! I started off with the basics that pretty much make life just taste better… butter, sugar, cinnamon. Then things got a little carrot cake-y. 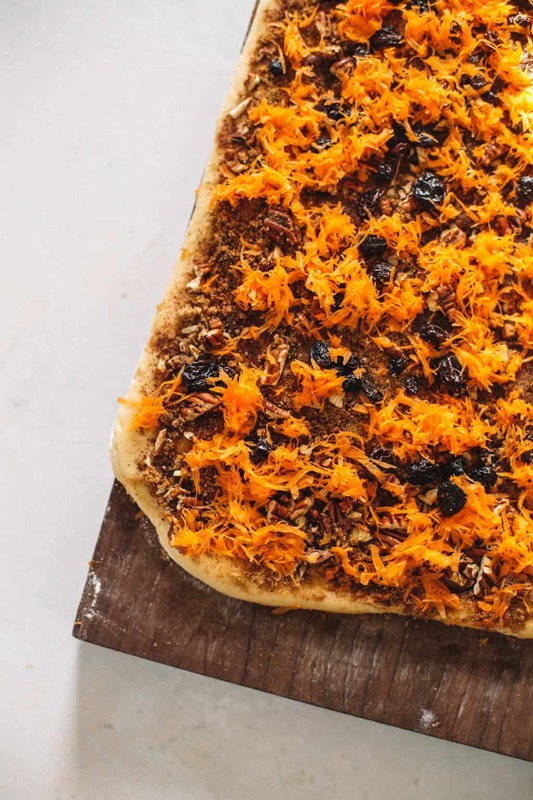 On top of the butter and cinnamon sugar mixture I finely grated two whole carrots, added finely chopped pecans, and studded the dough out with raisins. Yes, if you really hate raisins you don’t have to add them in. 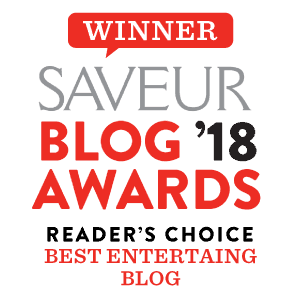 They’re a carrot cake classic in my book! YES! You can! 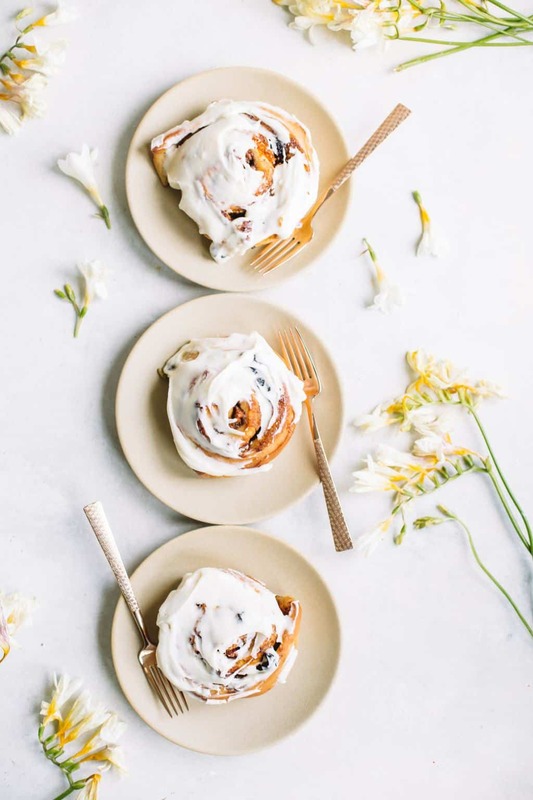 But there a few easy steps to ensure your carrot cake cinnamon rolls will be just as tasty the next day. After I let the dough rise once and fill and cut the cinnamon rolls, I wrap them up extremely tight in their baking vessel with plastic wrap. You don’t want any refrigerated air to enter into the rolls or they will begin to dry out and NO ONE wants that. The second important step! Take the rolls out an hour before you bake them to come up to room temp. This will actually let the cinnamon rolls rise again and get super big and puffy! Then, you’re ready to bake! If you’re really looking for a simple morning you can even make the cream cheese icing the night before as well! 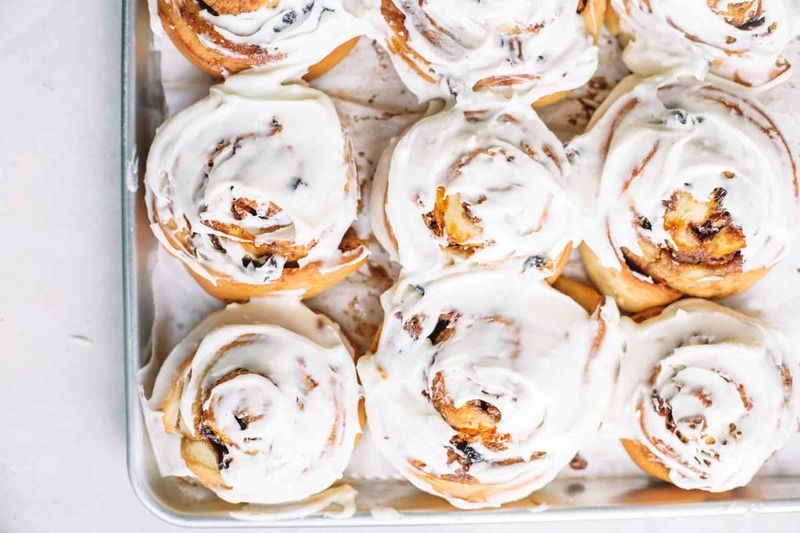 Just seal the batch up tightly in a Tupperware and bring to room temp before slathering all over these delicious carrot cake cinnamon rolls. Dissolve yeast into warm milk for 5 minutes or until foamy. While yeast is dissolving, combine brown sugar, butter, salt, and eggs into a large bowl. Mix in two cups of flour, and then mix in yeast + milk mixture. Mix in remaining flour until dough is easy to handle. The dough should be elastic but not sticky. Sprinkle flour over a large surface and knead for 5-10 minutes. 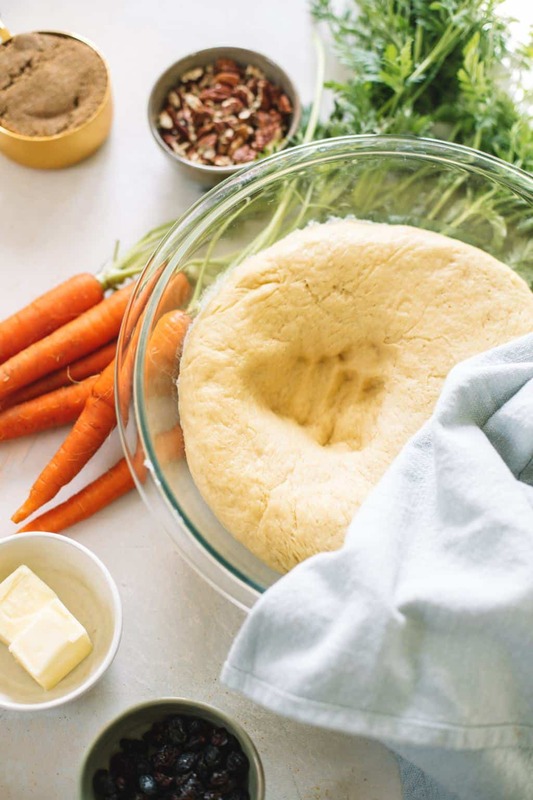 Place dough in a large well-greased bowl (I sprayed mine with Pam) and cover with two clean dish towels without touching the dough. Place in a dry area for an hour to double in size. Punch down the dough and roll out into a large 15×9 rectangle on a floured surface. Spread evenly with softened butter, brown sugar, shredded carrots, raisins, pecans, cinnamon and nutmeg. Very gently roll dough together. Cut slices about 1 inche thick and arrange close together in a greased casserole dish or on a large baking sheet. Brush the tops and sides of rolls with melted butter. Bake for 25-30 minutes or until lightly golden. In a large bowl fitted with a hand or standing mixer, add in room temp butter, cream cheese, and vanilla extract. Beat for 2-3 minutes. Add in 1 cup of powdered sugar at a time and 1 tablespoon of milk or cream after every sugar addition. Spread evenly onto warm cinnamon rolls! 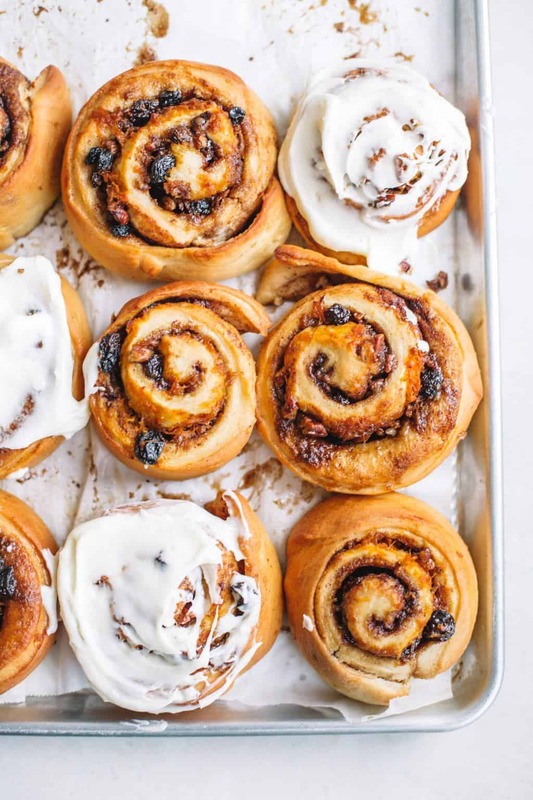 If making rolls the night before, skip step 3 and wrap your baking sheet or casserole dish filled with cinnamon rolls extremely tight with plastic wrap. Refrigerate overnight. One hour before baking remove rolls from the refrigerator and let rolls come to room temp before baking.